Gina Baldwin is a licensed Speech Pathologist with over 30 years of experience in the field. She holds a Bachelor of Science degree in Speech Language Pathology and a Master of Science degree in Speech Language Pathology from Southern Illinois University at Edwardsville, IL. Strongly motivated to make a difference in people’s lives, she currently devotes the majority of her professional time to providing speech therapy services in healthcare facilities and in home health environments. We are excited to welcome her as a guest blogger to ALS Connect. As a Speech Language Pathologist, I have experienced the joy of my patients’ successes as well as my share of frustration that I could not help them achieve more. I recognized a major gap in communication when I was providing speech therapy to a 68 year-old speech-impaired patient. She and her family became frustrated while trying to communicate using Skype. My patient tried to position her picture communication board toward the camera and pointed to pictures. Her family could not see what she was pointing to and there was silence. The picture communication board did not have speech output. I stood there and watched my patient become annoyed and I experienced it too. Augmentative and Alternative Communication (AAC) is a solution to replace and/or assist in everyday communication situations. 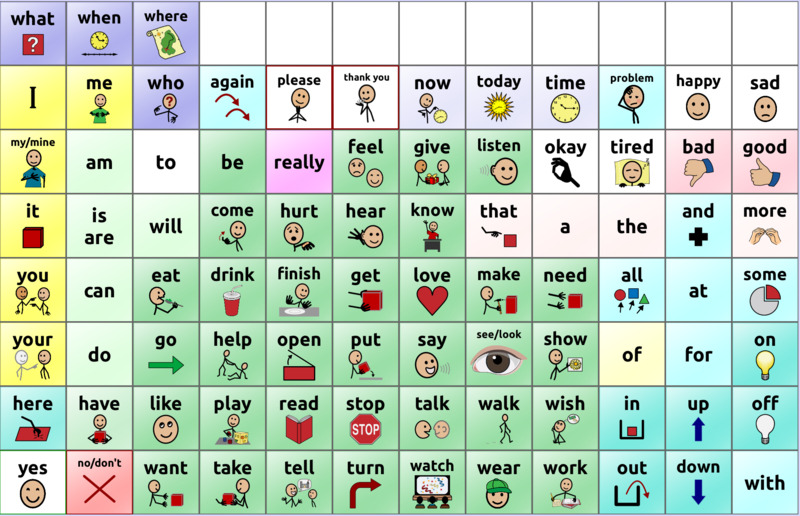 My patient and I discussed AAC, (also known as speech generating devices), but after many trials of different systems, we were back to square one; the picture communication board. We found that the AAC systems available did not meet her needs. They were too complicated for her to use and very expensive. In addition, she did not like the cartoon characters and stick figures that were used to depict a want, need or category. Frustrated that there wasn’t anything currently available that was appropriate for her situation, I set out to create something myself. I designed and created APP2Speak™ (APP2Speak.com) an inexpensive, easy-to-use AAC software application for the iPad. Users can customize pages and personalize lifestyle information by using their own pictures, adding words, phrases and select text-to-speech or record their own voice. Most people with ALS experience difficulty with speech and movement during the course of their illness. Some individuals will completely lose their ability to speak and to use their hands. The inability to speak is frustrating, emotionally devastating and one of the most challenging obstacles to manage successfully. Technology can be used to help a person with ALS to communicate so they can be an active participant in their family and community life, become more independent, and make medical decisions. These people must completely rely on another method to make all of their ideas, wants, or needs known. Several months ago I had the privilege of meeting a gentleman who had a great sense of humor. His wife helped him set up the custom pages on APP2Speak™. They took a picture of his mustache and recorded speech output saying, “Can you help me shave?” Another custom picture was a personal mug filled with beer and recorded speech output saying, “beer me”. Customization is a means to personalize your expression, to show your personality and to connect with family and friends. The gift of speech is worth millions of conversations. A few weeks ago I had the pleasure of having lunch with a friend I met at the ALS walk last year. I wanted to experience her voiceless world with her! We communicated using my voice (at times) and 2 AAC systems: APP2Speak™ and Talk to Me Technologies device. Talk to Me Technologies is a computer with Windows platform with speech output software. This AAC system allows my friend to accomplish many things, for example, email, Facebook, internet searches and communication. She also has an iPad with APP2Speak™ software application. She uses APP2Speak™ for communicating in situations when she doesn’t need to have a computer. It’s easy to use and she particularly likes the text-to- speech page. (She was the inspiration for me to add this feature). Communication is a means to express what we know. It is integral in all facets of life, especially the enjoyment of our relationships with loved ones, our friends and in our participation in everyday activities within our home and community. For more information on Assistive Technology and Augmentative/Alternative Communications Devices, please click here. You can learn more about APP2Speak™ by visiting http://www.app2speak.com/index.html.